ROSE-TINTED GLASSES. $2.3 billion. That’s how much Magic Leap had raised by March of this year. That’s a lot of pocket change for the Florida-based augmented reality startup. You might remember them from that video where a gigantic virtual blue whale leapt out of a gym floor in front of an awestruck audience. 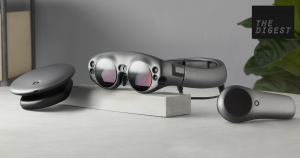 And you can get your hands on one of their headsets sooner than you might think: Magic Leap announced it will ship the first mixed reality headset — creatively called the Magic Leap One Creator Edition — this summer. Telecom giant AT&T will be the exclusive seller in the U.S.
THAT’S IT? But then we got a closer look, and it’s disappointing to say the least. One of the pre-recorded (very much not live) demos by the lead developers showed a little golem creature throwing a rock at the wearer, a “game” perhaps generously referred to as “Dodge.” Not only did the golem jitter around on the couch, the rock that the wearer was meant to stop with a raised hand seemingly passed right through it — not exactly the kind of cutting-edge, mind-blowing experience you’d expect from a headset that’s got billions of dollars and four years behind its release. A GROWING MARKET. The augmented reality market is growing fast, especially in the Middle East and Africa. A recent analysis by the International Data Corporation expects it to reach $6 billion by 2020. Microsoft, one of the biggest players in the mixed reality headset market, is still going full steam ahead with its HoloLens — a mixed reality headset that first shipped in 2016. Its proposed applications, however, are a bit different than those for Magic Leap. Microsoft has its eyes on industrial applications: architects examining virtual models of houses, holographic conference calls, and hardhat-mounted augmented reality for construction workers. Magic Leap seems to be aiming at something far more playful, more fun, and perhaps more likely to integrate into the daily life of the average person. It’s impossible to tell just yet whether Magic Leap’s disappointing showing will have a chilling effect on the industry as a whole. But it’s unlikely VCs are going to be quite so willing to invest in Magic Leap (or the next shiny AR company that comes after it) in the future. A MOONSHOT. Magic Leap’s ambitions couldn’t have been bigger. Video after video painted a magical future of highly-detailed models of the solar system floating in midair, one-of-a-kind AR experiences for a whole auditorium of school children, and so on. But this latest tech demo shows that it has a very long way to go.